One male was transported from the scene after a vehicle crashed into the porch of a residence. SIDNEY — At approximately 1:30 p.m. Thursday, May 17, a male was injured after a vehicle hit the front porch of a residence in Sidney. Police said there were three occupants in the vehicle. A male passenger was injured and transported by ambulance to a nearby hospital and the female driver fled the scene, police said. The accident occurred at 203 N. Main St., Sidney. 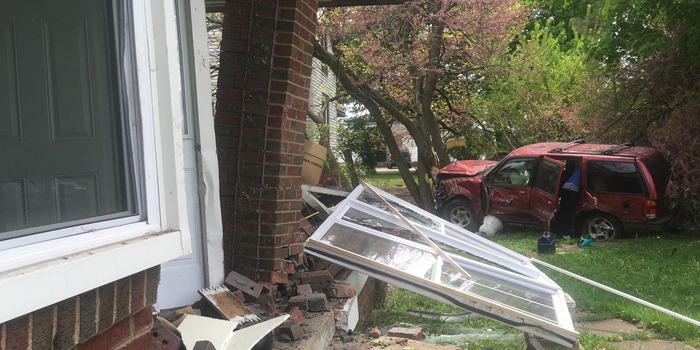 A maroon Ford XLT SUV traveling southbound on SR 13 left the roadway, traveling approximately 40 feet before traveling unscathed through the narrow space between two large trees, traveling another 70 feet and colliding with the brick enclosed front porch. A witness of the accident said the vehicle glanced off the house, traveling through the air and hit a large tree. Kosciusko County Sheriff’s Department personnel are on the scene investigating the accident.